A MURAL was unveiled at the Andersonstown barracks on Tuesday evening to commemorate the 30th anniversary of the Gibraltar/Milltown killings. 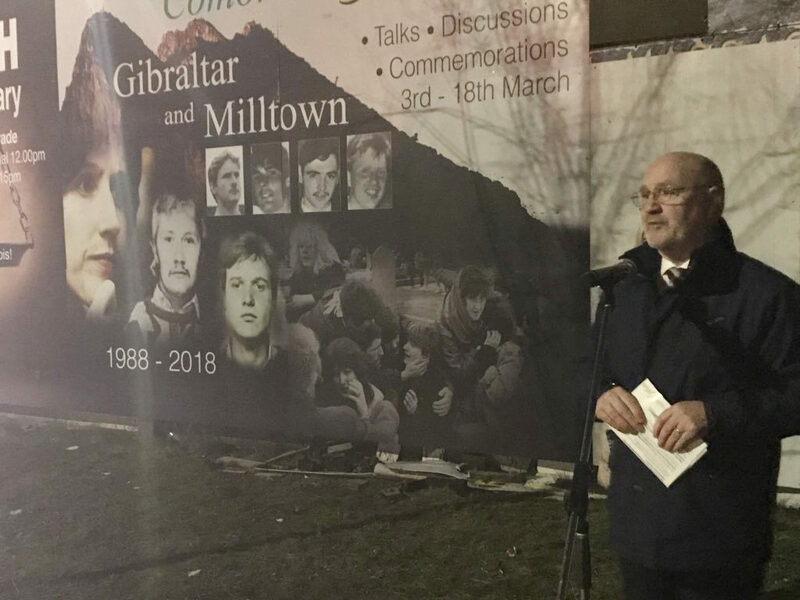 As the crowds gathered at the site Sinn Féin MLA Alex Maskey said: “This year is the 30th anniversary of the executions in Gibraltar of Maireád Farrell, Dan McCann and Seán Savage. “It is remarkable to see the turnout and it is testament to the feeling within the Republican community still. “We as republicans are proud to remember the sacrifice of these brave people. He added: “When the three bodies were returned to Ireland on 14th March I travelled with Mr Savage. Thousands of people lined the streets from Dublin to Belfast despite intense abuse from British state forces in an attempt to intimate. “This makes us realise the ferocity of British state violence and collusion with unionist death squads that was directed at our community 30 years ago. “The relatives of Seán, Maireád and Dan, unsatisfied with the response to their case by the British legal system, took their case to the European Court of Human Rights in 1995. The court found that the three had been unlawfully killed. This case became the benchmark for legacy cases and has helped many other families in their quest for truth and justice. “The events of 1988 and the people we lost did not deter republicans then and it certainly doesn’t deter us now.